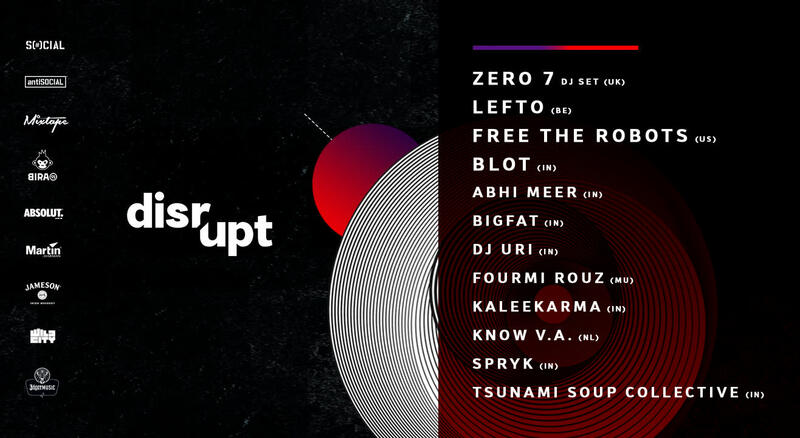 Disrupt is an urban festival celebrating music from the most forward thinking artists in electronic music from India, and around the world; showcased using the latest audio and visual technology, the festival's distinct offering for the music and nightlife community. Headlining Disrupt will be the British electronic act Zero 7 who is playing a DJ set, in what is a rare appearance by the act. Described by FACT Mag 'as your favorite DJ's favorite DJ', Lefto joins a line-up that also includes the beat movement pioneering producer and DJ, Free The Robots; India's favorite DJ and producer BLOT, Mumbai-based bass music producer Spryk, and DJs like Uri, Abhi Meer, Kaleekarma and bigfat alongside Amsterdam-based experimental duo Know V.A, Mauritian curator Fourmi Rouz and Goa-based selectors Tsunami Soup Collective.